ETA Motorsport are BMW trained technicians offering BMW servicing and maintenance at very competitive rates. The latest BMW diagnostic equipment is used on all services and pre-purchase inspection reports. As well as servicing we can carry out modifications to engine, suspension, brakes or any other parts you wish to upgrade.We are able to carry out anything on your BMW from a small part that needs replacing to a full engine change/rebuild. We can supply new and used standard BMW parts as well as a range of aftermarket tuning parts. All parts will be fitted at competitive rates by our enthusiastic team in our Kent based workshop. ETA Motorsport carry out servicing to main dealer standards using the same guidelines. All servicing is carried out using genuine BMW parts, thus maintaining your BMW warranty and ensuring your car stays in the best possible health.. Once a service has been completed, your service lights will be reset any your service book stamped, keeping your history up to date. We are also able to carry out any repairs that may need doing on your BMW or new Mini, as well as carry out diagnostics. No additional repairs will be carried out without us first contacting the customer with a quotation, this ensures there are no hidden costs when it comes to maintaining your vehicle. ETA Motorsport has many years of experience in the preparation of BMW track and race cars and are able to build a car to many different specs and budgets. In the past we have built cars to run in the Kumho BMW championship (winning championship in '98), Production BMW Championship (winning championship in 2008), Classis Saloon car championship and many others. We are also able to help our customers achieve a good compromise when it comes to taking their road cars on track, weather in be an uprated brake fluid change or a fully welded multi point rollcage. Not only does this apply to modern BMW's, if you want to go historic racing we are able to offer the same level of preparation and expertise no matter the age of vehicle. As you can see in our gallery we are also able to cater for other makes of vehicle, not just BMW's. ETA Motorsport are able to offer many different types of fabrication, all carried out to the highest standard. We are able to cater for small jobs such as a foot rest, right through to FIA spec weld in rollcages. Not only do we cater for BMW's in this area, we also carry out fabrication to other makes of vehicle, recently we have fabricated and installed rollcages into a Mercedes 190 Cosworth, 1964 Corvette and a 1964 Ford Falcon, all to be used in different areas of motorsport and built to their required regulations. It's not just race cars that we offer our services for, we can also fabricate parts for your road and track car. 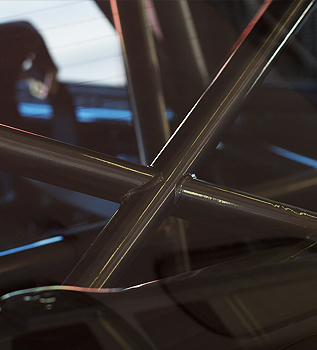 If you use your road car for the occasional track day an want the added safety and strength of a roll cage, not a problem, ETA Motorsport are able to cage a car while still retaining much of the original trim and interior for added comfort on the road. For examples of our work, feel free to take a look at our gallery or contact us to discuss your requirements.